They may be mindless entertainment, but is there anything zombie movies and shows actually get right? Zombies. They seem to be all around us—at least in the entertainment world. But we all know they aren’t real, right? We are told that they are the walking dead, the living dead, the undead. They have their own nation Z, and they are about to unleash an apocalypse upon the rest of us. Have you ever tried to make sense of this zombie thing? How is it that an undead person can crawl out of a grave (or be infected with a virus) and become a menace to the living? Why do they supposedly feast on the bodies of the living? How do they even know who is living and who is undead like themselves? And why do they walk like that—all stiff-kneed and halting? Are knees (and apparently elbows) the only things that stop working when you are undead? And what happens when they finally take over and everyone is undead? If you are like me, you might think the whole zombie thing is just a bunch of nonsense. The idea of a dead person coming back to life? That’s simply ridiculous! When you’re dead, you’re dead, right? Doesn’t the Bible confirm this when it says, “For dust you are, and to dust you shall return” (Genesis 3:19)? And, “For the living know that they will die; but the dead know nothing” (Ecclesiastes 9:5)? That sounds like the dead are dead—for good. When is the impossible possible? On the other hand, is there anything that the zombie genre gets right? Believe it or not, there is one slight shred of truth behind the idea of zombies—the dead actually are coming back to life! Humans have long been fascinated by the concept of the dead coming back to life, but have found it to be impossible. The truth is, it’s not impossible at all when the Creator of life Himself is involved. God is going to bring back the dead. He promises! Ezekiel answered, “O Lord GOD, You know” (Ezekiel 37:3). Most would give the same answer today because they really have no idea if the dead can come back to life. Isn’t that the stuff of Frankenstein and zombie stories? The dead returning to the land of the living may be entertainment to some, but such make-believe has no real connection to most people and their everyday lives. But what about you? You may be surprised to find that your Bible actually speaks quite often about the dead coming back to life. You, like most others, may be unaware that Jesus Christ stated nothing about an immortal soul going off to heaven when you die, but rather said, “Do not marvel at this; for the hour is coming in which all who are in the graves will hear His voice and come forth—those who have done good, to the resurrection of life, and those who have done evil, to the resurrection of condemnation” (John 5:28-29). Yes, Jesus taught that humans will be brought back to life after sleeping in death! Yes, Jesus taught that humans will be brought back to life after sleeping in death! The apostles believed what Jesus said and therefore taught the same thing. “I have hope in God, which they themselves also accept, that there will be a resurrection of the dead, both of the just and the unjust,” Paul declared to the Roman governor Felix (Acts 24:15). Resurrection literally means “standing up again.” Since a dead person cannot stand (even with stiff knees and elbows), resurrect means to be raised from the dead to become living once again. In spite of Dr. Frankenstein’s best efforts, bringing one back from the dead is impossible when humans are the highest power involved. But when the Creator is involved, the dead can be—and will be—brought back to life, no matter if they were buried, cremated or lost at sea. Sad to say, what zombie movies depict is a counterfeit resurrection to some sort of nearly dead condition where the undead attack, terrorize, kill and destroy. These erroneous ideas unfortunately can prejudice people’s minds against the good news that the dead will, in fact, come back to life. But not in a condition of half-alive and half-dead. The truth of your Bible is quite different. This astounding truth is hidden from so many people that your Bible calls it a mystery (1 Corinthians 15:51). Today this mystery is understood by very few, yet it sits in plain view for those given eyes to see. We would like you to come to understand this mystery. Your Bible plainly teaches that one group of “the dead will be raised incorruptible” (1 Corinthians 15:52). There is a resurrection, either to physical life or immortal life, in your future! Savvy readers will have noticed in both Jesus’ and Paul’s words quoted earlier, a teaching of at least two different times of resurrection from the dead. There is a coming first resurrection—of the just, those who had been justified—and a second resurrection—of the unjust, those who had not yet been forgiven. Note that since “all have sinned” (Romans 3:23), the just refers to those who have repented and been forgiven and lived faithfully. Paul elaborated on this first resurrection to spirit life. “Behold, I tell you a mystery: We shall not all sleep, but we shall all be changed—in a moment, in the twinkling of an eye, at the last trumpet. For the trumpet will sound, and the dead will be raised incorruptible, and we shall be changed. For this corruptible must put on incorruption, and this mortal must put on immortality” (1 Corinthians 15:51-53). We don’t have immortality now, but can have it at that time. Ezekiel makes us aware of a second resurrection, one to physical life, for those who had been unjust. “Thus says the Lord GOD to these bones: ‘Surely I will cause breath to enter into you, and you shall live. I will put sinews on you and bring flesh upon you, cover you with skin and put breath in you; and you shall live. Then you shall know that I am the LORD’” (Ezekiel 37:5-6). No half-dead zombies, but vibrant new lives in full health, ready for what God has in store for them. One of the key phrases here is, “Then you shall know that I am the LORD.” From this we learn that these unjust brought to life in this second resurrection had not really known the true God during their first life. Now they’ll have the opportunity to do so. The first resurrection is such a vital part of God’s plan that He reminds us of it in an annual celebration. It’s called the Feast of Trumpets. On this day we celebrate and anticipate what Jesus Christ will do in the near future. The Feast of Trumpets anticipates His return and, with it, the first resurrection. “For the Lord Himself will descend from heaven with a shout, with the voice of an archangel, and with the trumpet of God. And the dead in Christ will rise first” (1 Thessalonians 4:16). 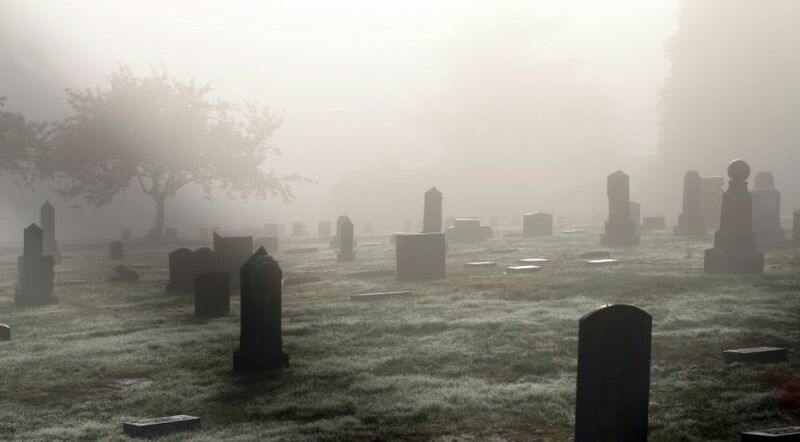 The dead in Christ—dead Christians—are asleep in the grave awaiting the wake-up call of the last trumpet. They will not be zombies, but glorious, powerful spirit beings because “we know that when He is revealed, we shall be like Him, for we shall see Him as He is” (1 John 3:2). Paul adds, “We shall also bear the image of the heavenly Man” (1 Corinthians 15:49). Revelation 20:4 speaks of those resurrected when He returns. “And they lived and reigned with Christ for a thousand years.” This thousand-year reign is pictured by another biblical festival, the Feast of Tabernacles. But there is yet another biblical holy day—called the Eighth Day or Last Great Day—that foretells another resurrection, the resurrection of all those who were not “dead in Christ.” These are the “rest of the dead” who “did not live again until the thousand years were finished” (verse 5). What happens when they are resurrected? The unjust who didn’t know God will now have the opportunity to come to know God and become just. The books of the Bible and the Book of Life, previously closed to them, will be opened for them. God explained it this way to Ezekiel: “‘Then you shall know that I am the LORD, when I have opened your graves, O My people, and brought you up from your graves. I will put My Spirit in you, and you shall live, and I will place you in your own land. Then you shall know that I, the LORD, have spoken it and performed it,’ says the LORD” (Ezekiel 37:13-14). If you are not familiar with these annual celebrations that the Bible calls holy days, we invite you to read “Trumpets, Atonement, Tabernacles & the Eighth Day.” Check them out in your own Bible, and ask God to open your mind to understand what the Bible tells us to do. No, zombies are not going to come crawling—or stiffly walking—out of the grave to begin an apocalypse. All of that is clearly fiction and a human distortion of God’s truth. But there is a coming reality—a real resurrection from the dead—that will give every human an opportunity to walk in eternal life!